It didn’t take long for 2019 Avon Old Farms (Conn.) kicker Harrison Leonard‍ to decide on accepting a preferred walk-on spot at Notre Dame. 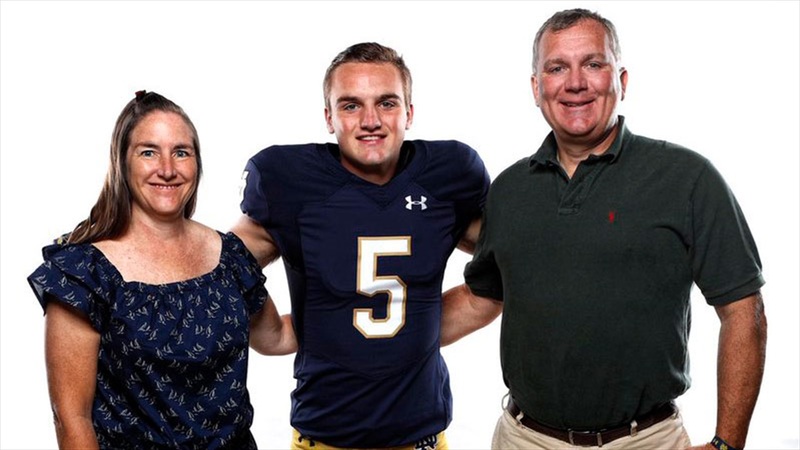 Special teams coordinator Brian Polian watched the 6-foot, 180-pounder kick on Thursday and an offer to walk-on at Notre Dame quickly followed. Leonard had several scholarship offers and Power Five programs keeping tabs on him, but Notre Dame was the school he was holding out for. “I’ve always loved Notre Dame, and my mom’s family is from around there, so I’ve always admired the program,” said Leonard. Kohl’s Kicking has Leonard rated as a five-star kicker and the No. 7 overall. Leonard took 1st place in a Kohl’s kickoff competition in May at 77 yards and then finished in 2nd place in the field goal competition after hitting from 61 yards. Kicking wasn’t always in Leonard’s plans as he originally wanted to play college baseball but those plans changed. One of the significant reasons Leonard wanted the chance to go to Notre Dame was the academics. Leonard was on an official visit to Notre Dame for the Vanderbilt game and got to see the athletic and academic opportunities in South Bend. The chance to earn the opportunity was something Leonard wanted, but he also fully embraced it. Justin Yoon will leave the program following the season and Leonard will get a chance to compete with Jon Doerer, who will be heading into his junior season.